Living a Fit and Full Life: Elizabeth Taylor White Diamonds Perfume is Just What You've Been Dreaming of! Elizabeth Taylor White Diamonds Perfume is Just What You've Been Dreaming of! Elizabeth Taylor White Diamonds Perfume is just what you've been dreaming of! Elizabeth Taylor White Diamonds Perfume has a soft blend of floral scents that are absolutely dream worthy. I love that Elizabeth Taylor White Diamonds Perfume isn't overpowering and that all the different scents blend well together. If you really take time to smell this perfume you'll truly understand how beautifully amazing it is. It has a wonderful array of scents that take you to another place place in time. 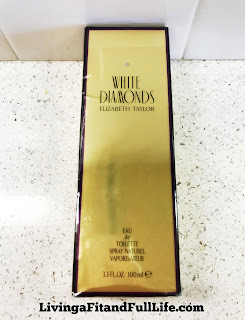 Elizabeth Taylor White Diamonds is a fragrance that my mom has worn for years so it's a fragrance that reminds me of my childhood which is just one of the many reasons that I love it so much! Elizabeth Taylor White Diamonds is a classic fragrance that has stood the test of time! Click HERE to find a store Macy's store near you!